The 1964 Plymouth Belvedere has 383 Cubic inches of bright orange Mopar big block resides under hood. Up top is a new Mopar Performance '68-69 style air cleaner for an OEM look. There's an Edelbrock AFB carb underneath, bolted to an Edelbrock Performer manifold. Chrome valve covers add flash, and the fender mounted Blue Streak coil is a 60's touch, but there's some nice upgrades in here too. You'll notice the dual field alternator with matching Mopar voltage regulator on the firewall while a closer examination reveals a new wiring harness. Mopar's electronic ignition (with ECU hidden in the dash) lights the fires through new wires while a high flow water pump and a re-cored, correct 22" radiator keep temps under control. 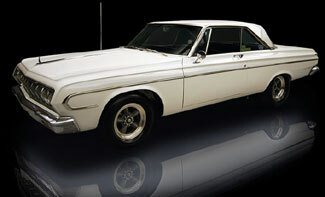 The exterior of the 1964 Plymouth Belvedere sets the tone more for what's not there than for what's shown. There are no gaudy stripes, no million dollar chameleon paint job and no 20 inch chrome rims. The car doesn't need it: Its crisp white paint, clean trim and timeless wheels do all the talking the car needs. Start up front at the re-chromed bumper and restored grille, move down the straight sides, clean sheet-metal and clean glass to the re-chromed rear bumper and clean original taillights. The solid chassis makes for a stable platform for the power up front. Clean sheet-metal from front to back is well coated in white paint on this rotisserie restoration. Of course, all of the brake and fuel components were changed out in the name of safety, and new lines for both run fore and aft. The dual exhaust system was in perfect working order but didn't have the punch the car deserved, so we threw on a set of Summit Racing chambered mufflers. Even white cars have to sound tough when they're this good looking!